Wakefield Trinity and Huddersfield Giants were tied at 16-16 with three minutes to go after a hard-fought contest. David Fifita celebrates drawing Wakefield level. PIC: James Heaton. All eyes turned to the veteran half-back, playing against his former club - where he spent nine years of his career - as an expectant North Stand at Belle Vue waited with baited breath. The opportunity soon came as the ball was flung back to Brough who slotted over a decisive drop-goal to give Wakefield back-to-back home wins for the first time this season. 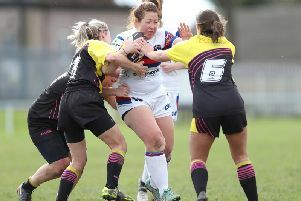 Giants had led for large parts of the second half, with Wakefield struggling, at times, to break down an almost-impenetrable defence. The influential David Fifita laid the platform for the victory as he crossed for two tries in the second half, proving unstoppable from close range. Reece Lyne opened the scoring. PIC: James Heaton. Huddersfield were more than a match for their Yorkshire foes, leading at half-time and frustrating Wakefield for the majority of the game. It is becoming habit for Wakefield to beat Giants on home soil, with victory extending their winning home run over Huddersfield to four games. Trinity started the game the better of the two sides and made their early territory pay on 14 minutes. The Giants had conceded four penalties under pressure from the hosts and succumbed to the opening score when Ryan Hampshire slipped it Reece Lyne who dived under the tackle to plant down. Jacob Miller rushes to congratulate David Fifita after scoring his first try of the night. PIC: James Heaton. The visitors responded well, however, and were level a few minutes later. From a contentious penalty - where Jacob Miller was penalised for interference after rolling away - Huddersfield worked it up field before booming it out to Jermaine McGillvary to dot down unchallenged for his 150th Super League try on his 200th career appearance. The away side took the lead soon after as Oliver Russell kicked a penalty goal from in front of the uprights. There was plenty of frustration for Wakefield for the remainder of the half, with more ill discipline preventing them from getting into an attacking rhythm. The Giants went further ahead just after the half hour as Darnell McIntosh was slipped through a gap and he made no mistake in grounding the ball. Things could have got worse for Wakefield just before the half-time hooter. The ball was worked wide to McGillvary and with the line at his mercy, the prolific England international knocked on to let Trinity off the hook. It took 25 second-half minutes for Wakefield to draw level as Fifita burst the line and side-stepped McIntosh to score under the posts. However, the Giants full-back put his side back in front as he beat the Trinity defence to ground a reverse grubber minutes later. Fifita was on hand to drag Wakefield back into the game though, as he crashed through the tackles to edge his way over. A mistake from Huddersfield gave Trinity a scrum 10 metres out and on the fourth tackle it was flung back to Brough who kicked the one pointer in front of a jubilant North Stand at Belle Vue. Wakefield Trinity: Hampshire, Jones-Bishop, Lyne, Arundel, Jowitt, Miller, Brough, Fifita, Wood, Arona, Pauli, Ashurst, Crowther. Subs: Horo, Kopczak, Hirst, King. Huddersfield Giants: McIntosh, McGillvary, Turner, Senior, Uate, Russell, Frawley, English, Leeming, Matagi, Hewitt, Mellor, Lawrence. Subs: O'Brien, Roberts, Ikahihifo, Taai.